Our practice of sending a few highly specialized troops to fight the enemy while leaving the vast majority of Christians out of the spiritual battle is our great omission. 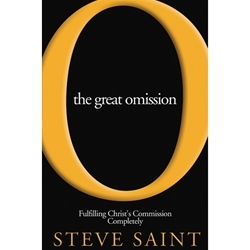 In this powerful call for the inclusion of indigenous believers in the Great Commission, Steve Saint, the son of Nate Saint, shows how current missions strategies have unwittingly harmed the indigenous church and kept millions of believers from fulfilling their roles in God's kingdom - and millions of others from hearing the Good News. In the same spirit as his father, Steve Saint picks up the torch as he shares his strategic insight concerning world missions.